L-R: Daniel Holbach, David Planella, Yours Truly, Jorge Castro, Michael Hall, and Nicholas Skaggs. Google Hangouts are awesome for team meetings. 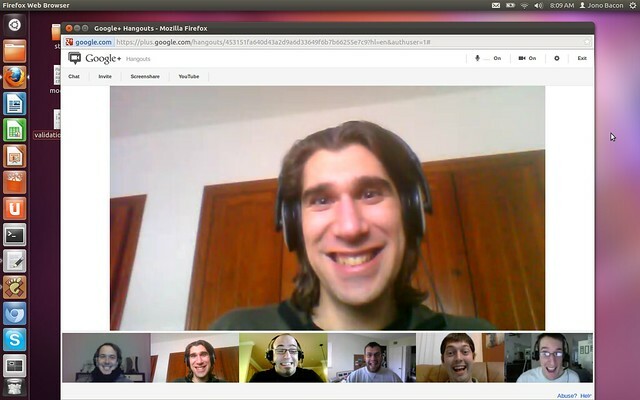 is canonical doing something to bring hangouts like feature to empathy/ Open source clients? Do you use desktop sharing? Wow, this really drives home the lack of diversity in the Canonical teams. Even the community team lacks female and minority voices! Skills are more important then gender/race. I agree that it would be nice to have more diversity, but I don’t hire based on race or gender, I hire based on the best candidate and each of these folks were the best candidates. Also, Canonical is a hugely gender and race diverse company.